Showvision Events & Entertainment is a company in Toronto Ontario Canada presenting entertainment & other services to event planners, and party organizers. 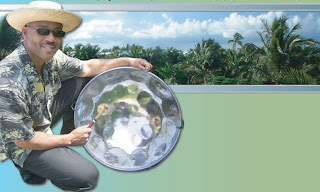 Hu our steel drum bandleader, was born on the island of Trinidad & Tobago, the land of the steel drum. Hulan studied music with the Royal Conservatory of music and later graduated from Humber College Music Program. His repertoire not only includes the traditional Harry Belfonte calypsos and Bob Marley reggae songs, but also many R&B and Jazz standards. He has performed extensively throughout Canada and the United States. His lively singing combined with Keyboards and steel drum, with audience interaction creates a memorable event. Some venues include the Canadian National Exhibition, Nottawasaga Resort, Harbourfront and Port Credit Yatch Club, Deerhurst and Talisman Resort, Malibu Rum, the Boulevard Club, Weddings. Other appearances include. 2008 include Horseshoe Valley Resort, Cranberry Inn Resort, City of Peterborough Tourism, and Cobourg Water. Hugh has performed along side many artist including Robert Michaels, The Ink Spots, Arrow, Dennis Desousa and Jesse Cook. © 2008-2018 Showvision Entertainment. All rights reserved. corporate events, galas, weddings and parties. Toronto's premier live entertainment company. Showvision is insured.